From wrangling to building, these gloves are strong enough for a wide variety of jobs. Cow grain leather material provides durable, long-lasting use. Gloves feature a good balance between abrasion-resistance, dexterity, durability and comfort. Shirred elastic back, cotton hemmed and a keystone thumb pattern provide maximum comfort. 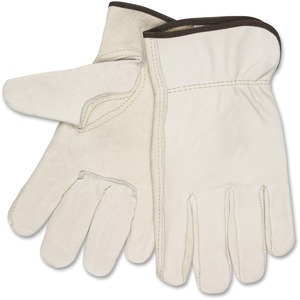 Gloves are perfect for carpentry, construction, driving, farming and more.